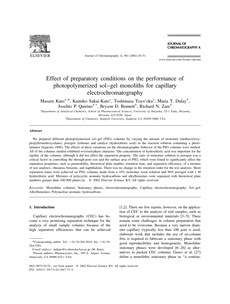 We prepared different photopolymerized sol–gel (PSG) columns by varying the amount of monomer (methacryloxypropyltrimethoxysilane), porogen (toluene) and catalyst (hydrochloric acid) in the reaction solution containing a photoinitiator (Irgacure 1800). The effects of these variations on the chromatographic behavior of the PSG columns were studied. All of the columns studied exhibited reversed-phase character. The concentration of hydrochloric acid was important for the rigidity of the columns, although it did not affect the separation property. The ratio of monomer solution to porogen was a critical factor in controlling the through-pore size and the surface area of PSG, which were found to significantly affect the separation properties, such as permeability, theoretical plate number, retention time, and separation efficiency, of a mixture of test analytes—thiourea, benzene, and naphthalene. There was no change in the retention order for the test analytes. Short separation times were achieved on PSG columns made from a 10% monomer stock solution and 90% porogen with 1 M hydrochloric acid. Mixtures of polycyclic aromatic hydrocarbons and alkylbenzenes were separated with theoretical plate numbers greater than 100 000 plates/m.